One of the very first muffin recipes I ever attempted to make “healthy” was my banana chocolate chip muffins, and the only reason those were better than a typical muffin was because they had coconut oil and oat flour. Although of all the chocolate pretty much negated any “healthy” points I may have earned. My family still loves those muffins, but when I had a bunch of bananas going brown a bit quicker than I thought they would, I wanted to make something that tasted more… sophisticated. Just a smidgen more grown-up maybe? Something that reminded me more of fall and less of chocolate and truly were healthier than a typical muffin. 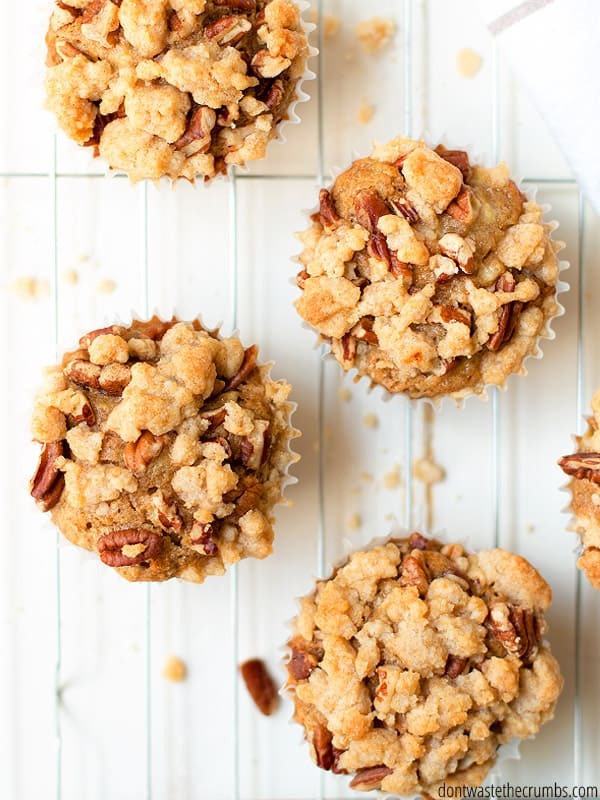 How about banana nut muffins with crumb topping? I should clarify that I have nothing against chocolate whatsoever. I’ll happily indulge in a chocolate zucchini mug cake, black bean brownies or a bowl of 5 minute chocolate hummus any day of the week. Put a batch of strawberry chocolate granola on the counter and I assure you, I’ll eat the whole thing, grabbing one handful at a time when I pass by the kitchen. But sometimes it’s nice to not have chocolate too. Or should I say, sometimes it’s nice not to be tempted to eat a whole pan of something when you’re already indulging and bulging a little more than you should be thanks to everything pumpkin season. Flour: Half of the all-purpose flour is swapped for whole wheat flour. More whole grain means more fiber which is good all of the time, but especially in a season of indulging. Butter: Half of the butter is replaced with some yogurt (here’s how to make homemade yogurt). Like chocolate, I have nothing against butter, but I’m adding butter in with the crumb topping, so it would be wise for my waistline to take some out of the batter. Sugar: Not half, but ALL of the processed sugar is being replaced with honey and maple syrup. It’s my goal to eat less processed sugar this year, and my 50/50 substitution trick works in almost any baking recipe. In our banana nut muffins though, we’re cutting the amount nearly in half too. Afraid I halved the flavor too? Oh no my friends, because there are two magical words still left to discuss: crumb topping. When you were a kid, did you ever pick the crumb topping off of a coffee cake? Guilty as charged here and I won’t even pretend I didn’t do it. I got no shame – crumb topping is the best! The reason why crumb topping rocks so much is because it’s the trifecta of baking: flour + butter + sugar. Everything taste better with flour, butter and sugar! 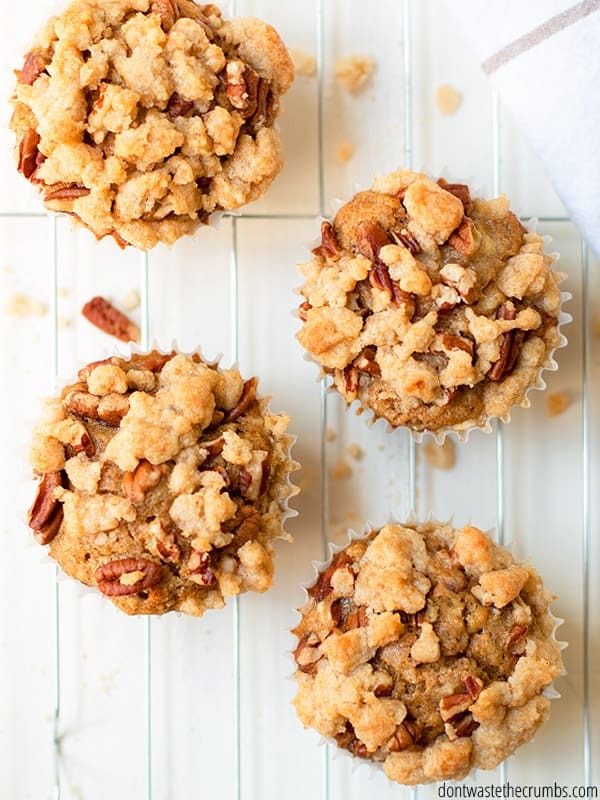 In the case of our banana nut muffins, you simply combine them in a bowl, crumble them on top of the nuts and muffin batter and let the oven do its magic. When the timer goes off, you have a perfectly moist banana nut muffin with a delicious balance of pureed banana and chunks of banana in every muffin. Meaning unlike most banana nut muffins, YOU CAN ACTUALLY TASTE THE BANANA. 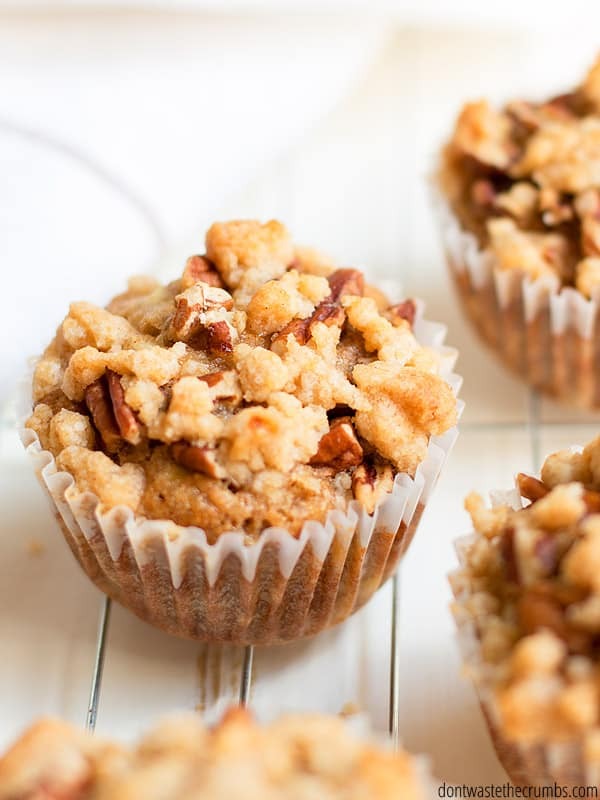 You have nuts (hopefully pecans) that are slightly warm, slightly toasted and slightly crunchy that are a spot on match for the muffin underneath them. And then you have the crumb topping, tying all of the above into a neat little package ready for you to consume. Yes, I think the goal is achieved here. Banana nut muffins that are grown-up and sophisticated and lighter on the waistline yet still packed with flavor. Proven by the fact that both kids AND husband alike went back for seconds at breakfast and then ate the rest for a mid-morning snack. In a small bowl, combine flour, baking soda, salt, cinnamon and nutmeg, Whisk to combine. Set aside. In a separate small bowl, mash 1 banana with a fork until clumpy, but not pureed. Set aside. In a bowl of a standing mixer, combine ⅓ cup honey/maple syrup and 1 banana. (Tip: You need ⅓ cup of sweetener total, so to save on dishes, I fill a ⅓ measuring cup halfway with honey and then top it off with maple syrup.) Using the whisk attachment, turn the mixer on medium low and set the timer for 3 minutes. The mixture should be very smooth and very well combined when the timer goes off. Add the melted butter, Greek yogurt, egg and vanilla and mix well, scraping down the sides of the bowl if needed. Fold in the mashed banana and dry ingredients with a spatula until JUST combined. Divide the batter evenly between 12 muffin tins. Each muffin tin should be about halfway full with about 2 heaping Tbsp of batter each. Gently tap the muffin tin on the counter to pop any air bubbles. Sprinkle the pecans evenly over the muffins. Set aside. In either of the bowls you previously used, combine the granulated sugar, brown sugar, cinnamon and melted butter for the crumb topping. Mix together using a fork OR the whisk from the batter. 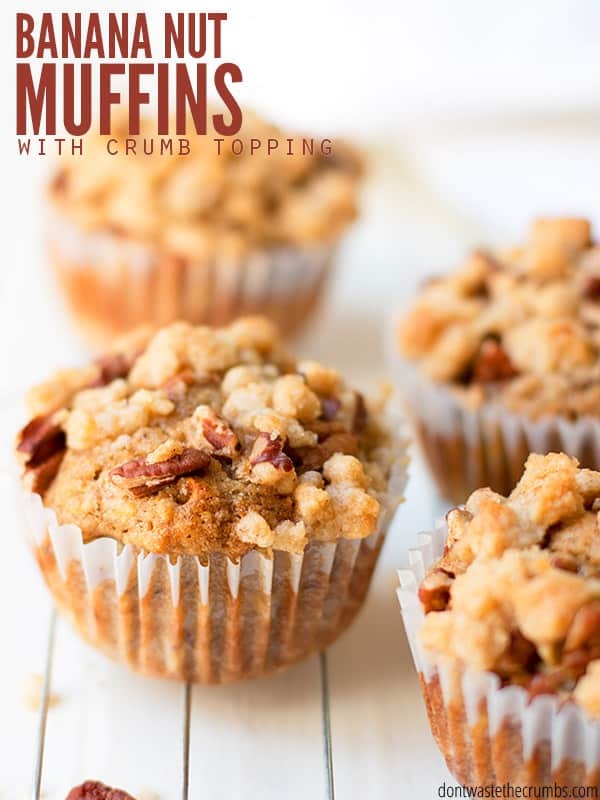 Using your fingers, pinch off some crumb topping and break it apart over the muffins. Bake the muffins for 18-20 minutes, or until a toothpick entered in the center comes out clean. Best served warm, but keep well for a couple days in a container with a lid. This recipe works great doubled or even tripled to make extras for the freezer. You can even freeze the batter before you bake if you prefer. Batch cooking and freezer cooking are my best friends in the kitchen. Learn more about my methods to make Real Food Fast with this free 5 day course! How do you like your banana muffins – sweet or savory?